2. (+) Alternating POVs - The alternating POVs really helped build the suspense both for the romance and for the beginning, when June and Day haven't met yet, though you know when they do, it's going to be explosive. I also liked how different June and Day's perspectives were from each other -- it was nice contrasting the cynical and admiring POVs on the Republic and nice to see them converge as time goes on. 3. (+) History/World-building - I love, love, LOVED the world-building. I liked the hints of the USA versus how it now is the Republic and the Colonies and how the Republic hides this information from its people. I liked those echoes of American history like the President and coins and the election and loved the way the society had become so very militaristic and how the Trial was like a hyped up SAT. Dystopians often make me doubt them just because of how violent the societies are, but I could see the dynamics of this kind of society being possible. 4. (+) The Romance - The best part about the romance was that it felt appropriate for this book. By that I mean that June and Day are distrusting people, but because of their circumstances, their relationship grows in such a way to make it feel realistic, and in a society where June doesn't who she can turn to, it makes sense that she would look to Day and look at him differently... it also makes sense that Day, who was alone for a good part of his life, would admire someone who have the same survival skills that he has. I liked that their romance also had both sweet and bad turns - those made it seem more believable. The romance didn't overwhelm the book; it was a great complement to it. 6. (--) Weird font change - Just my personal preference, but I hate it when publishing companies change fonts and font colors. Day's section was in a different font than June's and had a goldish color to it and it just looked weird to me. Yes, really nitpicky, but I can't help it. 7. (+/-) Villains - I definitely believed in the danger that the villains posed, but I didn't feel like I quite understood why they did it or how things got to be that way. I think the book was a little short of what most YA ones are nowadays and I think it really could've been longer, added in a few more details about the society and its history and how Elector Primo somehow is on his 11th term, etc. etc. 8. (+) Writing - Marie Lu's writing is easy to read and easy to visualize. I especially liked how you could see the character development mirrored in the writing and how June's chapters became less closed off as the book progressed. 9. (+) Pacing - Didn't put the book down once. Each chapter flows into the next, and I could not get through it fast enough. There is a lot of great action to carry the story. 10. (+/-) The Cover - I know they probably chose this cover to attract both boys and girls (as well they should, like THG), but personally I don't like it. The Mockingjay is a really important symbol for THG, and this must be the Republic's coin or something, but I don't remember reading about it enough for it to be on the cover. 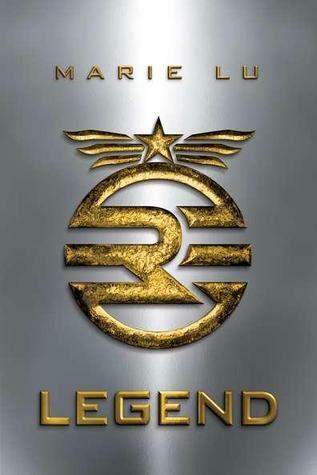 Legend is the start of a fascinating dystopian trilogy with characters and a world that has enough potential to rival the Hunger Games. (Yeah, kind of cliche to say, but it's the first time I've ever said that so ;P). You don't want to miss out on this debut! Excellent review! 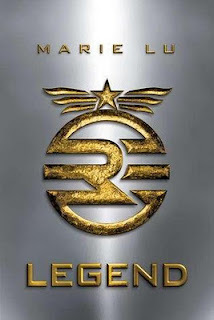 I loved Legend! I cannot believe that this book hasn't come out yet. It seems like I have had my eye on it forever. Great review, I cannot wait to read it. I do love your review but I dislike the romance part(unlike you do cos you like it lol), because they're only 15 yrs old! Too funny that they kissed in the story but still I do loved the world!